This post is relevant for toddlers who are past the formula/breastfeeding stage. We traveled internationally with our little one with the confidence (or should I say over-confidence?) that she would adapt to milk differences if needed. After all, she had tried goats milk with success and we grew up drinking buffaloes milk so why would we anticipate any problems? Her grandparents even knew where to get cows milk if needed so it should be fine …right? WRONG! Our hungry little toddler who usually does not fuss about milk (touchwood) took a few sips of the milk offered to her and refused any more. I put the first cup refusal down to jet lag. The second cup was no better. Ok, lets try skimming the entire cream off before pouring her a cup …aah that was better. At least she drank a few sips. But now I’m worrying about inadequate caloric intake. After another day of frustrating attempts, we have now resorted to feeding her yogurt instead of milk. She seems ok with the home-made yogurt. Numerous discussions later we realize that one of the main differences in milk that she is used to vs what is available is “Homogenization”. Milk in the US is usually homogenized whereas milk delivered to households in India is usually not. What is homogenization you ask? Wikipedia defines homogenization as a process that “breaks the fat into smaller sizes so it no longer separates at any fat specification”. Uuhhh…the completely skimmed milk should have given me a clue right ? The good thing is we had a solution. 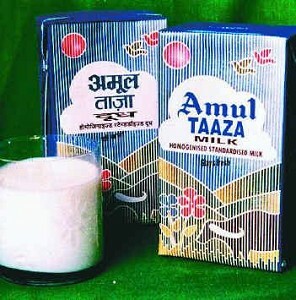 There were local tetra packs available by the famous Indian Amul brand that had homogenized and pasteurized milk. The tetra packs were not commonly stocked so we hoarded them like gold. So after a lot of trial and error we had a solution. Our little toddler was enjoying milk again. Whew! Now your toddler might not have this preference for homogenized milk but in case he/she refuses the milk abroad, you might want to check if non-homogenized milk is the problem. Hopefully our experience made it easier for someone out there. Happy travels!